Maingear shows off the Pulse 11, a new 11.6" gaming laptop with Intel's Ivy Bridge processors and NVIDIA's GeForce GT 650M graphics card (with 2GB GDDR3). Pricing starts at $999. MAINGEAR, an award-winning PC system builder offering custom desktops, notebooks, workstations, is now adding the Pulse 11 high performance ultraportable laptop solution to their product line and is unmatched in its class for PC gamers who want to harness desktop-like power wherever they go. The MAINGEAR Pulse 11 combines the best in small form-factor laptop design featuring the latest mobile technology such as Intel's 3rd Generation Core processor with up to 8-thread processing with the Intel Core I7 mobile processor and offering 75% better performance with Intel's 3rd Generation Core i5 mobile processor compared with Intel's previous Core 2 Duo E8400/ P8600 processors. It's a perfect engine for power users who demand unparalleled performance on the go in HD, multitasking, or multimedia. 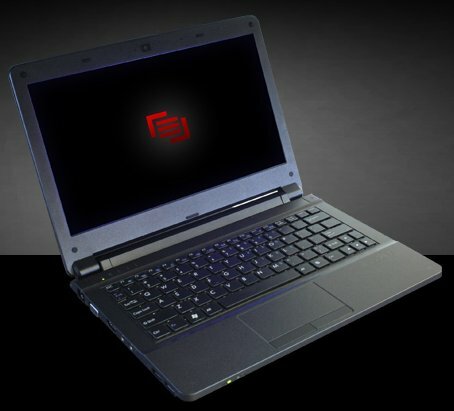 The MAINGEAR Pulse 11 custom laptop also utilizes NVIDIA's unique Optimus technology featuring the powerful 384 CUDA core GeForce GT 650 "Kepler" GPU that can automatically turn on or off the discrete DX11. Optimus technology also provides a rich 3D experience when you need it, yet delivers the power-sipping savings of integrated video when you don't. The MAINGEAR Pulse 11 was made for gamers looking for a powerful ultraportable that delivers the best of mobile entertainment in its size, and can go from the bedroom to car to a 60" HDTV in a living room via the HDMI output offers. Pulse 11 custom laptops offer clean and simple design along with great added features such as built-in THX TruStudio Pro Sound-certified speakers that deliver a richer mobile sound stage. The MAINGEAR Pulse 11 was designed to meet the needs of gamers, students, on-the-go digital warriors, and anyone looking for power in the smallest package possible. "The MAINGEAR Pulse 11 offers it all; the best of a desktop in a ultraportable form factor." Said Wallace Santos, CEO and Co-founder of MAINGEAR Computers. "With the power of the latest 3rd generation Intel Core i7 and i5 Mobile processors, dedicated discrete GPU and high performance wireless, this system is packed with amazing gaming and 3D performance; giving our customers the best mobile experience they have come to expect from MAINGEAR." "With the Intel Core i7 mobile processor in MAINGEAR's Pulse 11 offers unrivaled PC performance that gives gamers what they are looking for; power and lightweight mobility with desktop like performance." Said Joakim Algstam Gaming Segment Ecosystem Marketing Manager for Intel Corporation. "MAINGEAR has always been in the forefront of adopting new technologies and providing innovative options to meet the demands of PC enthusiasts, the MAINGEAR Pulse 11 is the perfect example of this."